It's another project life layout for my daughter's first dance recital. I cried when I saw my daughter dragging her dance bag along the floor as I watched her walk down the hall with her teacher. Not even four and about to perform while I watched. And for the first time... I realized that she is growing up. I am excited but I want to keep all the memories. I tried to explain it to my Mom, to my Husband but I think it's a Mother's thing. I couldn't explain the emotion. So when she came on stage I felt relief that she was there. Well, because I have been putting QR codes on my layouts. 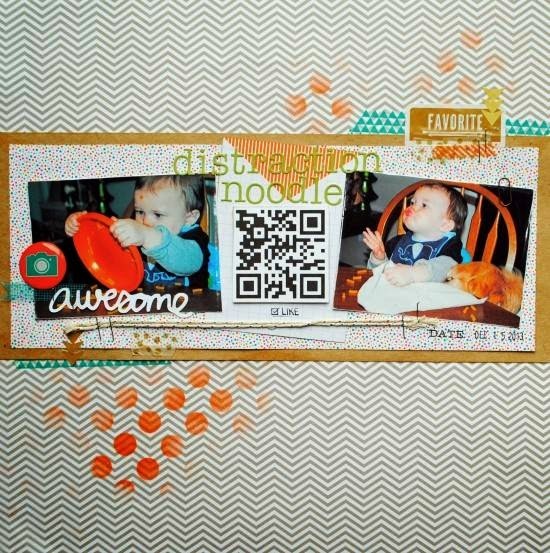 See my post here on Canadian Scrapbooker Magazine to see where. This means that if you scan the code, it is linked to the video of her performance. It's a memory preserved in time that I can always cherish as long as the link is alive. 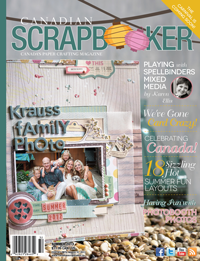 I got the idea for Canadian Scrapbooker Magazine. Here's a traditional layout with a code. You can see that I left the die cut out on the other side as white. I like that you can see through it. Also, the bottom half is largely pictures. I just love the pictures and I could look at them all day. I didn't think they needed any other embellishments. Don't forget to e-cut out a bunch of die cuts like I did with the "today". 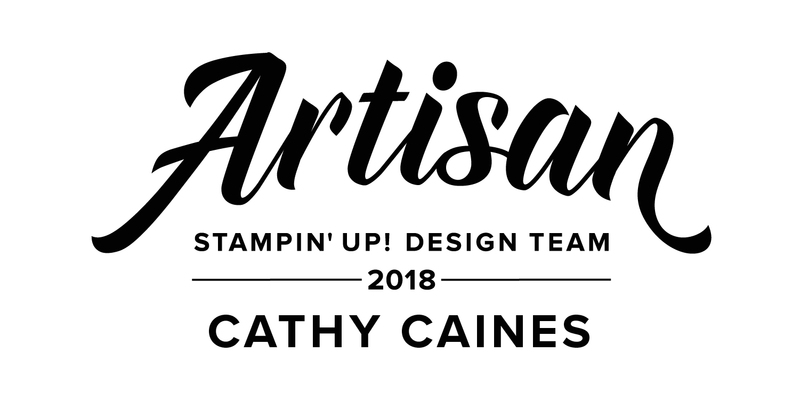 My term is over as part of the Stampin' Up! Artisan Team. I am soooo happy to have been part of the whirlwind. And I am soooo happy you joined in every week. Don't forget to follow me on Facebook and on Bloglovin'. Check out Cindy's project for this week! CATHY! I missed you today! Do I need to book a flight and come track you down?! I need your witty banter to brighten my day! QR codes? Mind. Blown. LOVE LOVE LOVE everything you make! Ev.Er.Y.Thi.NG! 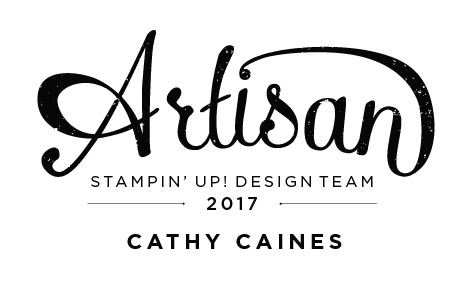 I'm so excited to continue working with you in Stamps in the Mail. You inspire me with all your out-of-the-box thinking. LIKE, wayyyyyyyyyyyy out of the box. I LOVE IT! and I love you! You rock. BBS fo' life, yo! There are no words to adequately describe how grateful I am for your friendship, for your humour and for your inspiration! I will come see you there in your neck of the woods one day and am looking forward to continuing to be inspired by you and to laughing with you as we stay friends and as all of us work together in our monthly blog hop! 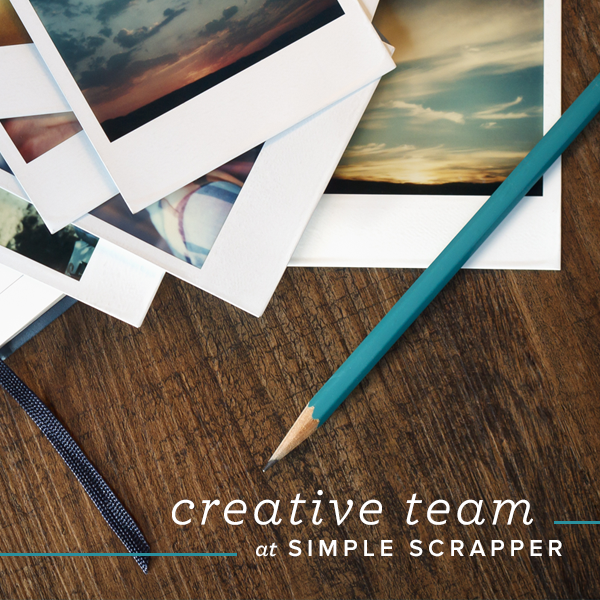 Everyone needs a friend and crafter extraordinaire like you in their life! Love you Miss Cathy Caines! Cathy, when they made you, they broke the mold! You are beautiful, witty, hilarious, and so full of life! It shows in everything you create. 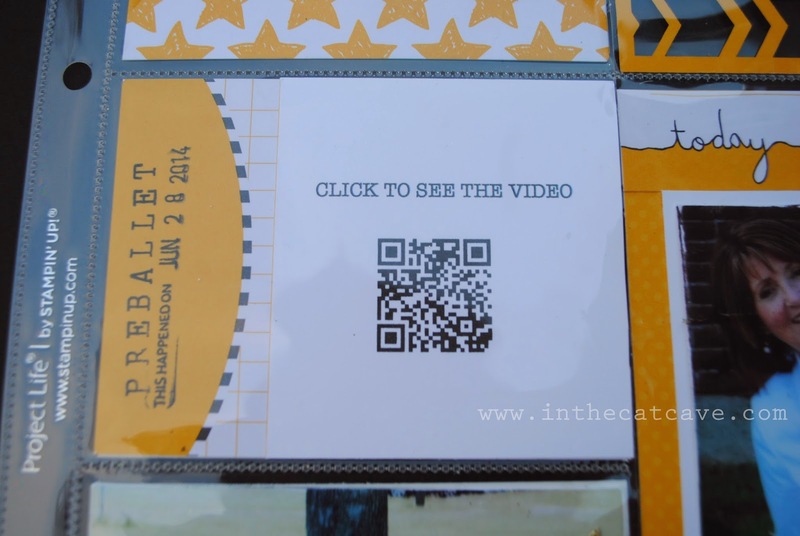 I totally envy your amazing scrapbooking talent and I am so blessed to call you my friend! I look forward to seeing what your future holds. All my love! Hugs! not going to cry, not going to cry.... oh who am I trying to kid? Your talent is truly only matched by your beauty. You have such an amazing way of looking at things and you constantly inspire me. 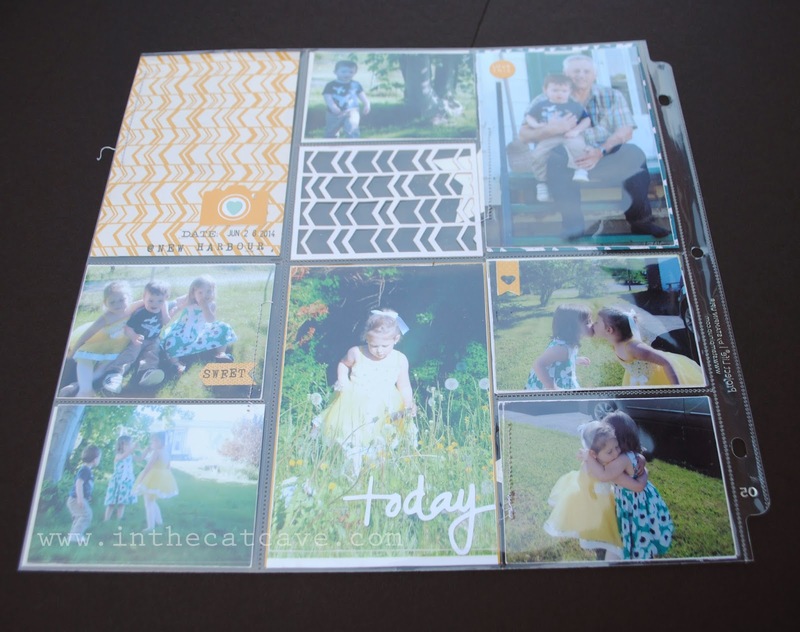 I really am jealous of your scrap-booking SKILLZ!!! You never cease to amaze me. Thank you for introducing me to Coffee Crisps, Ketchup Chips and for reminding me always to just be me! Love you! These pages are so sweet!! And I love the QR codes!! Why didn't they have that when my boys were younger? Guess I can document the teen years and embarrass them later! 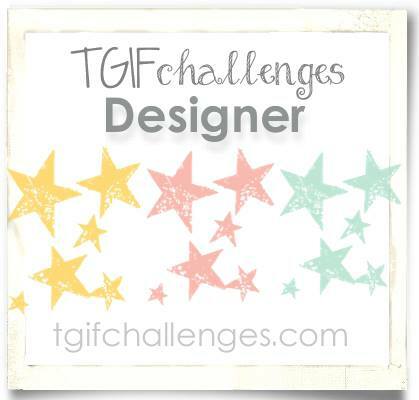 :) Thanks for sharing your fabulous creations! totally love these pages! 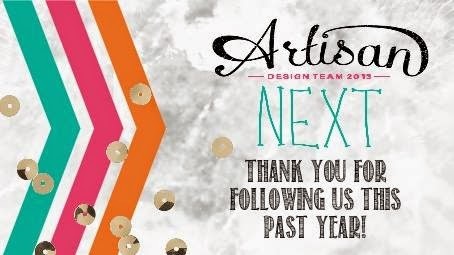 Have enjoyed following your creativity and will continue to do so. Love these pages, and the QR code...so smart! I've enjoyed following you this year. Congrats on your year, and good luck in all your upcoming creative endeavors. Could you be any cooler? I mean really, I feel almost like one of the cool kids because I got to hang out with you for a year. See, that probably isn't even the right term….cool. Hmmm. Anyway, every now and then I try to incorporate a little bit of Cathy into my stamping and I really love it. It is fun! Like you. Thanks so much for the laughs and for sharing your crazy skill! Awwwww - thanks Jen!!! Well, I'll be following every you do and hopefully catching you in the air! Thank you for a wonderful year of inspiration and a wealth of ideas!